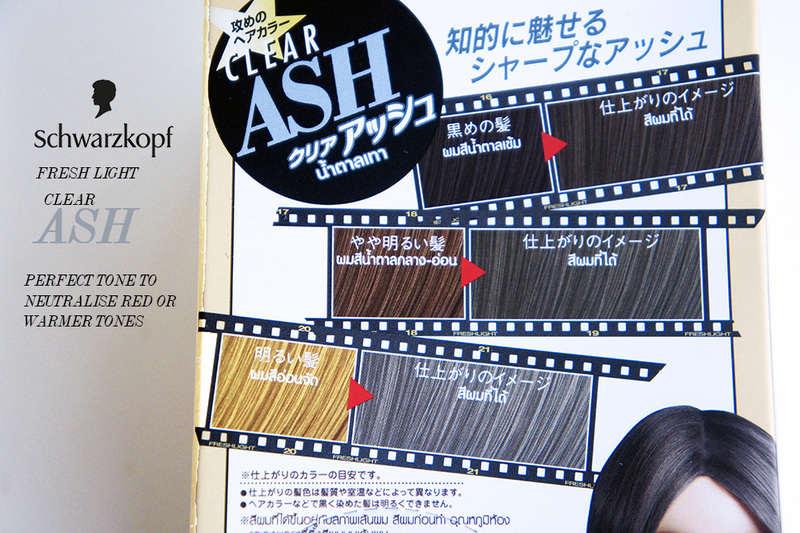 SCHWARZKOPF FRESH LIGHT CLEAR ASH HAIR DYE [REVIEW]: Toning down red tones. I decided late last night out of boredom to colour my hair. I’ve had this box of Schwarzkopf hair dye since my trip to Hong Kong early this year and I’ve been meaning to try it out for a while. I got the Schwarzkopf Fresh Light Dye in Clear Ash because I am really getting so annoyed with this gross, orange tone in my hair. I mean it’s not even a tinge of orange, it’s full blown, ‘bleach gone wrong’ brassy orange! The bad condition of my hair is my own fault for dying and bleaching my hair so much. Especially after last year where I turned my dark, dark hair into a mane of crazy red! If you fancy seeing my Red Hair check it out HERE. I admit the red was really fun while it lasted, but ever since, I’ve been having a nightmare trying to tone down the red undertones left on my hair. Even after using a super dark hair dye the red would always keep peeping through. After a few washes and weeks go by, this orange grimness takes over and I’m left looking as bright as the tango man. Anyhow, so I decided on the Clear Ash Shade to try and neutralise some of the red tones and bring it back down a notch. I got this from Watsons in Hong Kong but you can find it on YESSTYLE.com for £10 HERE. 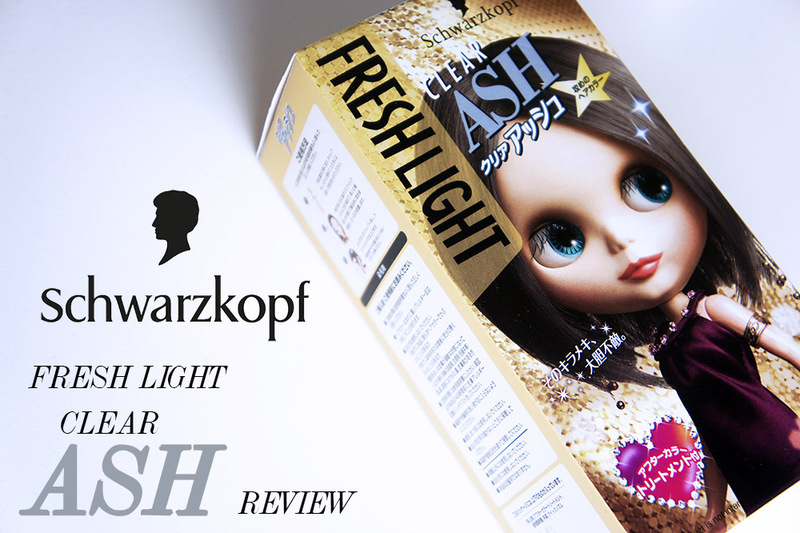 Schwarzkopf Fresh Light is a DIY hair colour kit. I hoped it would work better for me than what I’m used to here, since it’s made in Japan I assume that they would target Asian Hair a lot better than UK hair dyes. I couldn’t read the Japanese on the box and the YESSTYLE site doesn’t say too much either, other than this dye is easy to use and non drying. There are a good range of shades to choose from, but as I said, I went for Ash to help tone down the red/orange tones in my hair. The box itself had a push out hole in which you can use to hold the bottle of hair dye as you work the dye through your hair. I thought this was useful for keeping your work station mess free. Although I still managed to make a huge mess anyway. The instructions itself was in Arabic…? Yes Arabic, not even Japanese! So that was no help to me whatsoever. Luckily, I’ve dyed my hair enough times to know the general gist of it all and managed cope ok lol. To use it was simple, simply empty the colour cream into the developer put the lid back on and shake to mix. You then swap over the lid to the nozzle comb and start applying. The nozzle comb have tiny holes for the hair dye to come out of as you squeeze and comb through the hair. I found this method a bit fussy, despite it being designed for ease of use. I think it’s because the solution was quite runny, so after a blob of dye landed on my carpet I decided to give the nozzle a miss and worked the solution through the hair with my hands instead. I did however use the nozzle afterwards to comb through my hair to make sure I’ve not missed any bits. I have super long and thick hair and I was worried that one box wouldn’t be enough. I managed ok with 80ml of solution but I think I probably could have done with having an extra bottle. Judging from the diagram, it recommends leaving it on for 30minutes but I left it on for 45 so that it’ll come out darker. I rinsed the solution out and used the treatment conditioner on the hair after my normal shampoo. EASY TO USE RATING: 3/5. The solution was really easy to wash out too, I was impressed by how little time it took for the water to run clear. However it lost two points because the formula was a little too runny and I had to be extra careful not to let it drip everywhere. The other point was lost on the design of the bottle, it was ok when the it was full, but as soon as it was past the half way mark it took quite a bit of doing and effort to get to the product. The condition of my hair or at least the appearance of my hair has drastically improved. My hair was looking very dry and this hair dye seems to have disguised my dead ends and brittle hair very well. My hair looks a lot glossier and feels softer too. I liked the product and the results I got, next time I should try it with two boxes to see if I get a better colour payoff. I actually have another box of this dye in Champagne Pink which I will give a go in a few weeks time, depends on how long it takes for the orange to come back. It’s a bit expensive for £10 but I think I may have to resort back to it since I really like way it’s managed to tone down the red but not mask it with a dark, solid colour. I was worried that my hair would look flat and dull with a one tone colour, but I was pleased to see it didn’t mask over my ombre and has given it quite an interesting effect. What do you think guys? Massive improvement on the orange hair right? lol. Have you tried this dye? What are your thoughts? Tags: Ash Hair, Clear Ash, DIY Hair, Fresh Light, Hair, Hair dye, Schwarzkopf Hair Dye. Bookmark the permalink. Did you apply the dye on your whole hair? How long did you leave it in as well? 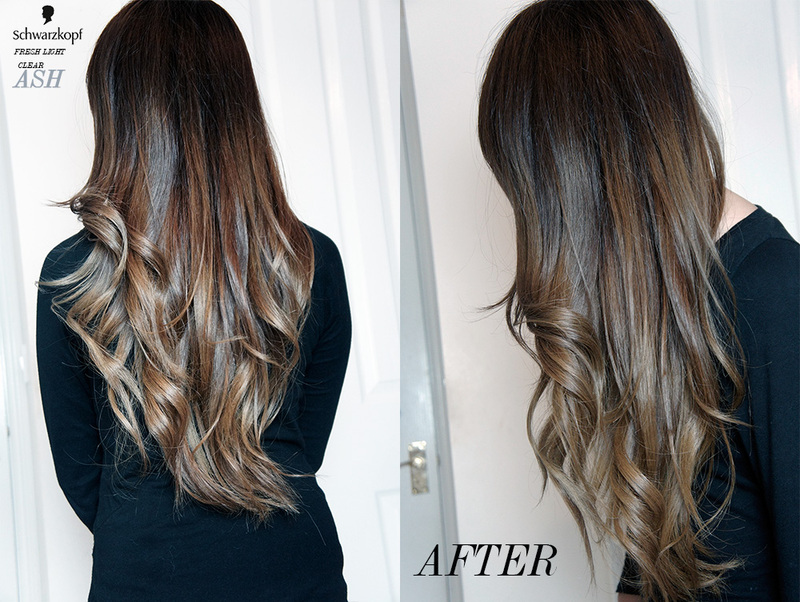 I have the same ombre going on my hair right now and am having the same issue! I want to get rid of this orangutan orange and warm it up!! I’d like to know this as well. I’m in the same situation! I love it! Is this ash color the best of the freshlight colors to tone down red hair? how long does it last? 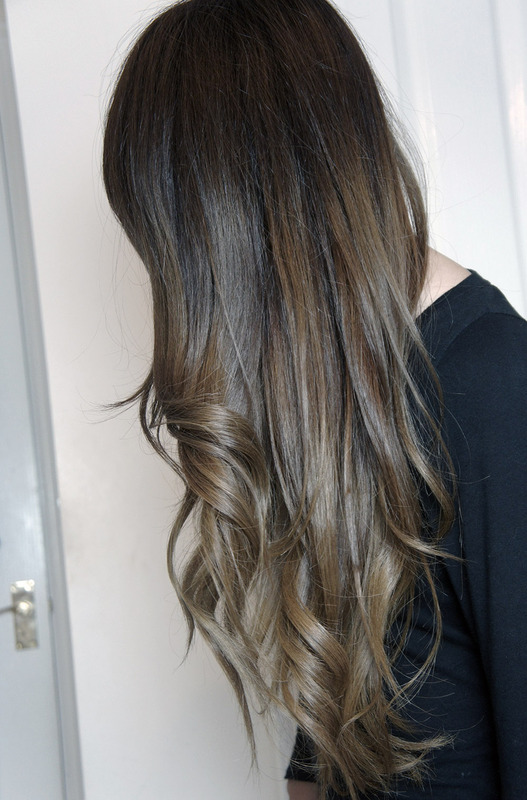 its sooo prettty :0 . do the color fades to the orange colour again? продуктов, про здания и детей и многих других. С Промокодом У вас появится возможность почувствовать все преимущества онлайн шопинга. безвозмездную доставку товаров и множество других даров с каждым новеньким заказом. У нас найдутся выгодные предложения для целых магазинов! но к тому же наиболее доступным и выгодным. Промокод — это чудо промокодов! Отыщите подходящий Вам промокод возьми нашем сайте только из-за пару минут! Ежели вы теснее знаете, промокод какого магазина ищете, то Вам нужно ввести его название в искательской строчке вверху сайта и надавить на значок «поиск». целых торговых центров Промокода понизу сайта. в которых наличествует работа, который Вы отыскиваете. Остается только пользоваться преимуществами волшебных промокодов! уже давно передался на новейший уровень. Сейчас это никак не изнурительная ходьба по торговым центрам, а поиск подходящего продукта в сети интернет. а не просто выполнение покупок. Nice blog here! Additionally your web site so much up fast! Excellent write-up. I definitely love this site. Continue the good work! Undeniably watch free movies online is a cut-rate and great pleasure particularly for movies lovers. get time for you, as you alone can experience an unlimited excitement running in veins, by entering into the online world of movies. your hair looks so fabulous and not damaged at all. the previous colour suited you but the new one looks so amazing and even professionally done!! how long did it last cuz I searched the product and on others it faded in like a month or less? and snacks included. Actually, a limousine can be as simple as a nice Lincoln Town Car. I remember my favorite Halloween party like it was yesterday. Is the clear ash discontinued? I am looking for it but can’t find it!!! All what I see is sugar ash, berry ash and airy ash. Could you refer to any reputable site to buy the dye online (I’m in Europe) so it should ship internationally if is located in Japan. na barriga) me frustra as vezes. A cirurgia de aumento peniano será feita logo após Carnaval, com Dr.
de 3 litres (12 tasses) par jour. Where in Mexico can i find this product?